India’s two-wheelers market, one of the biggest in the world, keeps on expanding day by day in segments. Earlier the majority of the audience prefer to purchase lowered displacement and budgeted bikes. But now when a bigger part of the Indian population is youth, they tend to choose their riding companion as per their taste without thinking twice about the pricing of the bike. This passion for bikes is not only made the domestic auto majors roll out bikes in displacement above 500cc but also the international manufacturers. 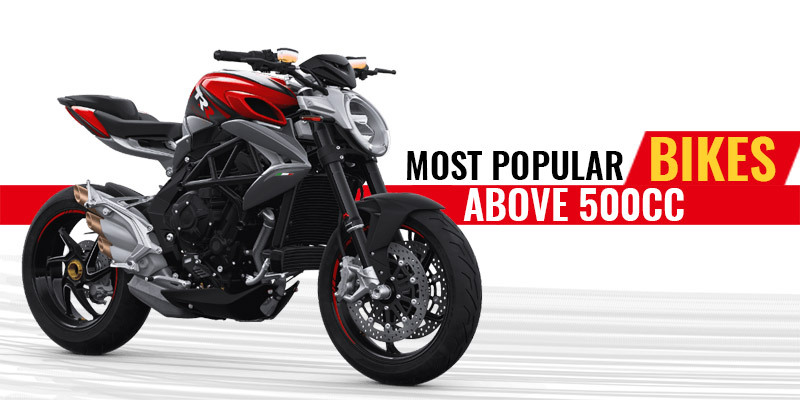 Here is a list of new bikes with engine capacity more than 500cc in India in 2019. In its second inning with Adishwar Auto Ride India-subsidiary of Hyderabad-based Mahavir Group, Benelli has launched the TRK 502 adventure tourer in India at the pricing of INR 5 lakh (ex-showroom). With fitments such as the beak-like fender up front, large windscreen and knuckle guards on the handlebar, the TRK 502 is a true adventure tourer with the ground clearance of 190mm. Powering for the TRK 502 comes from 500cc parallel-twin, liquid-cooled engine which makes out 47bhp and 46Nm via a mated 6-speed gearbox. The suspension gets 50 mm USD forks up front and a rear monoshock with a rebound and preload adjustability. A pair of 320mm disc up front and a 260mm rear disc along with dual channel ABS to manage to break on the bike. Ducati Monster 797 is an entry-level model in the Monster series globally. It is priced at INR 7.77 lakh (ex-showroom, Delhi) which makes it’s more affordable over others in the available range. Consequently, the Italian bike maker slashed electronic package via a big margin and you will be availed with ABS only as standard fitment. The Monster 797 carry forwards the styling of its elders while the components such as the fuel tank and headlamp are shared bits from the Monster 1200. It is powered by an 803cc Testastretta, air-cooled twin-cylinder motor which makes out 74 bhp of power and 69 Nm of peak torque. The power transmission takes place via a mated 6-speed gearbox with a slipper clutch as standard. It is the most advanced model in the provided adventure range of motorcycles from BMW Motorrad. The new R 1250 GS Adventure Pro bike is built to conquer rough routes, adverse conditions, and the most remote destinations. Also, with the improved engine displacement, it generates more power for wilderness, desert or country road. While the introduction of an all-new variable camshaft control BMW ShiftCam technology the rider gets sovereignty in every engine speed range. Moreover, the optional Riding Modes Pro, one can tuned bike depending upon riding situations and purpose. In addition to this, one can adjust throttle, the behavior of ABS, dynamic traction control and suspension compensation Dynamic ESA. one of the most powerful production motorcycles on earth, the Ducati Panigale V4R has been launched in India. The sports bike carries a staggering price sticker of INR 51.87 lakh (ex-showroom). Only five units of this exclusive motorcycle are offered by the Italian bike maker. Behind the fairing, this road-legal WSBK category racing bike packs a 998 cc V4 Desmosedici Stradale R engine. The mill which not only meets the WSBK homologation rules but also develops the whopping power of 221 bhp and transmits 111 Nm of peak torque via a mated six-speed manual gearbox. Honda CB1000R+ is the lately introduced model in the Honda India lineup. Launched at a premium price tag of INR 14.46 lakh (ex-showroom Delhi), the Neo Sports Cafe Racer is only available to purchase at Honda Wing dealerships in Mumbai and Delhi. The Honda CB1000R Plus is powered by a 998cc, inline four-cylinder, liquid-cooled engine that makes out 145PS at 10,500rpm and 104Nm at 8,250rpm via a mated 6-speed gearbox. Among the list of premium features and electronic aids, the motorcycle packs disc brakes, dual-channel ABS, slipper clutch, bi-directional quick-shifter, all-digital instrument console, LED headlight and three riding modes with setting adjustments, Honda Selectable Torque Control (HSTC), ride-by-wire respectively. The much-awaited Flat Tracker for the streets, Indian FT R 1200 and FTR 1200 S has launched in India. One can book for the motorcycles at the token amount of INR 2 lakh at Indian Motorcycle dealerships across the country. The company priced the motorcycles at the premium price tag of INR 14.99 lakh and 15.49 lakh respectively (both ex-showroom). These bikes are being said inspired by the Championship-Winning FTR 750 race bike. It gets a powerful new liquid-cooled 1,203 cc V-twin engine that develops the maximum power of 120hp. Fast, agile and thrilling in ride quality, the Indian FTR 1200 and FTR 1200 S offers a sporty, upright riding position with nimble handling. Among the features, the FTR series gets electronic aids of Bosch stability control with a six-axis inertial sensor and selectable riding modes and a 4.3-inch colour touchscreen dash. Norton Motorcycles which trades in Indian in alliance with the Kinetic Motoroyale has launched the limited edition Norton Dominator in India at INR 23.70 lakh (ex-showroom). This pocket burning price tag is due to the motorcycle will be available in the country via the CBU route. FYI, only 18 units of the motorcycle were allocated to India. Featuring an aluminum tank and tail section, the Dominator is a cafe racer with clip-on handlebars and a small flyscreen which offers it a retro appeal. Norton Dominator gets power from a 961cc, air-cooled, parallel-twin engine that makes out 80PS of power at 6500rpm and 90Nm of torque at 5200rpm, mated to a 5-speed gearbox. In its segment, the Dominator will pose a fierce competition against the sole rival the BMW R nineT Cafe Racer. The Brutale 800 RR is the latest product in MV Agustas Indian lineup. It is priced here at INR 18.99 lakh (ex-showroom, India). The MV Agusta Brutale RR is an improved iteration over the standard Brutale with more power and other changes. It packs a 798cc, liquid-cooled, three-cylinder motor which develops 140hp at 12,300rpm and 87Nm of torque at 10,100rpm via a mated 6-speed gearbox with a bi-directional quick-shifter. The motorcycle is claimed to touch the top speed of 244kph. Among the gizmos, the naked beast comes equipped with four riding modes, eight-level traction control and switchable and adjustable ABS. Other than this, the suspension setup comprises 43mm, fully-adjustable, Marzocchi USD fork and Sachs monoshock. While the braking on the RR is handled by radially-mounted, 320mm dual floating Brembo brakes up front and 220mm unit at the rear. The Kawasaki Ninja 650 holds a strong position in the middleweight sports touring segment, but, it needed a dire update since a very long time. Mulling over the same thought, the Japanese manufacturer brings comprehensive changes to the variant for next year. The model in discussion gets inspiration from the ZX-6R and is enriched with sharper styling. Mentioning the matters of the heart, the Kawasaki Ninja 650 will admire the same 649cc parallel twin motor, though, it is now Euro-IV compliant. Sadly the power has been reduced to 69BHP on the new machine instead of the earlier 71BHP. The ergonomics have also been revised as the updated Ninja now gets a slightly lower handlebar and the riding position has also been settled down over the outgoing bike. Triumph has included a new Bonneville family- the T100, which carries more affordable Bonnevilles. Anticipated to be launched next year, these bikes are packed with a heart of 900cc engine unit and will be priced competitively lower than rest of the Triumph bikes. Talking about the technical attributes, the family features electronic stuff such as ABS, ride-by-wire, traction control system, torque assist clutch, LED rear light, engine immobilizer, USB charging socket, and stylish twin clocks. Spreading power is a 900cc high-torque eight-valve, parallel-twin engine that is tuned to deliver much higher torque, impressive fuel economy, and denser exhaust note. To revive the culture of cafe racers in India, the Indian epic brand Royal Enfield has done a serious attempt to make it possible in the country as well. The classic RE Continental GT is a perfect example of that. To retain its classy as well as vintage looks, the automaker has tried its level best to keep the blend of both. The oval-shaped chrome finished headlamp alongside retro-styled, orange colored side indicators are certainly flaunting its cafe racer look to the best. As far as the mechanicals are concerned, the compact designed Continental GT breathes via 648cc single-cylinder, BS IV engine that generates a maximum of 47 BHP of power at 7250 RPM and 52 NM of torque at 5250 RPM.